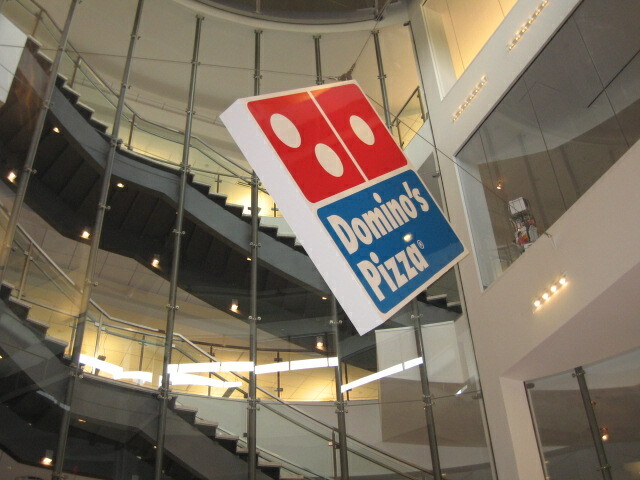 There’s a lot of buzz out there around the new Domino’s Pizza, so when Bullz-Eye.com was invited to spend a day the at the Domino’s headquarters in Ann Arbor, Michigan, we jumped at the chance. I first tried the new Domino’s back in May and I really liked the new pizza, so I was looking forward to going behind the scenes to meet the brain trust. When arriving in Ann Arbor I was met by the reps from Domino’s, other media bloggers and writers from other guy-related websites. Our group hit it off right away and the Domino’s team was first class from the start. When I made it to headquarters the lobby and artwork told the story of a company that has been around for 50 years (they are celebrating that milestone in December 2010) and a company in resurgence. We settled into the comfortable board room and enjoyed some refreshments to get things underway. Phil Lozen, the Social Media Specialist for Domino’s, took us to the Michigan Supply Chain Center about 20 minutes from headquarters. It was at the distribution center that we witnessed the precision and commitment to quality that is the engine that keeps this company running. The dough making process is clean, accurate and streamlined. The quality control system is also excellent, as Domino’s is careful to x-ray each dough ball to ensure that there are no objects in the dough that don’t belong. It was also interesting to see how important the distribution center is to Domino’s franchisees as they not only deliver the ingredients but help manage and stock inventory at individual Domino’s stores. Our way back to headquarters brought us to the test kitchen where our media team had the pleasure of learning all about the ingredients from Brandon Solano (Vice President Marketing & Retail Innovation, Head Chef) and Sam Fauser (Training Specialist). Both of these men are seen regularly in Domino’s TV commercials, but they are down to earth and really, really passionate about Domino’s and it shows. In the test kitchen we also learned about the improved ingredients that go into the dough, sauce and toppings at Domino’s and the numerous trial runs to “get it right and tight.” No crazy photo shoots are needed to make Domino’s pizzas look good – check out this video and you’ll see how things used to be done. Then it was time to make our own Domino’s pizza and I must say mine came out even better that I could have imagined. Regular dough, plenty of sauce, mixture of cheeses with provolone, pepperoni, onion, roasted red peppers, sun dried tomato and the kicker was new sliced sausage that was simply off the charts. Once my pizza went onto the oven it took 6 minutes and 30 seconds to bake. (Their newest oven can pump out pies in approx. 5 minutes flat!) Once the pizza is taken out of the oven those who want the garlic butter crust apply the goods on the crust and it melts right in. This gives each customer the choice of having garlic butter crust or just sticking with the regular crust. I should have entered my pizza in the Domino’s “Show us your Pizza” contest because mine was a winner. Our media crew did pretty well (hey, we had serious help) and once we headed back to the board room to chow down everyone loved their pizza. Towards the end of lunch executives from Domino’s joined us for sneak previews of some new commercials and a wide open question and answer period. This was very informative for all parties present as it was made clear to me that Domino’s has some very sharp people in charge of branding, marketing and product development. This isn’t the Domino’s of the 80’s and 90’s and when their team talks about quality and transparency they mean it! Let’s face it, Domino’s has been running a great marketing campaign over the past 8 or 9 months and that’s what convinced me to try their pizza again. But without the product to back it up any company will eventually fall short. With somewhere around 5,000 stores in the U.S., Domino’s pizza is being put to the test just about every second of every day. When I tried the new Domino’s and was asked by folks how could the new Domino’s be that good at such a competitive price point I told them to try it for themselves and the feedback was positive. 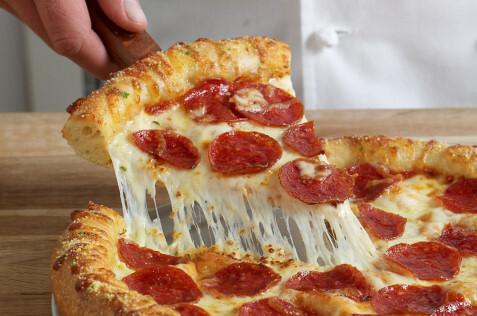 The Domino’s team understands that it takes time to change perceptions and with the new products and brilliant offline and online campaigns Domino’s is turning into an American comeback story! We’ve been hearing and seeing a lot lately about the all new pizza at Domino’s. Well since we love pizza it was time to check it out for ourselves and give you our feedback. I ordered a pepperoni, onion and roasted red pepper. When I opened the box it already looked better than the old Domino’s before I even took a bite! For me the sauce and crust are equally important so I was curious as to all of the hype around both. 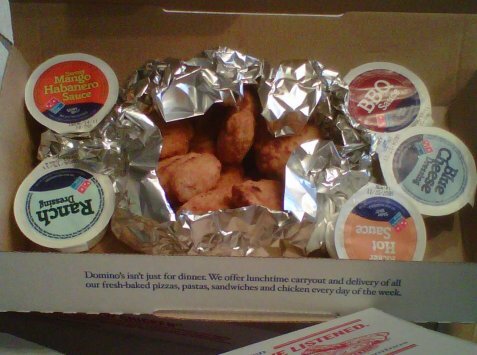 First the sauce: Domino’s billed the new sauce as bolder and I have to say it is clearly better. There’s much more flavor and a it’s a bit spicy and sweet, so they made a big improvement here. As for the crust, it has a garlic seasoning and there is no doubt the flavor went up a few notches, but if you’re not crazy about garlic you could get turned off on this pie pretty quick. On the other hand a lot of folks love the garlic flavoring and combined with the new sauce it garnered my attention in a good way. I thought the crust was very good. Finally, regarding the cheese, it was very tasty and the hint of provolone is right on the mark! Overall I feel that Domino’s improved on a pizza that was middle of the road at best and now has a pizza that can compete with the more expensive chains and the local joints. The improvement is huge with the sauce, crust and cheese all scoring high, so for that I say “all new” means “much better” for Domino’s!